This tool will help you to detect the latest Android vulnerabilities. 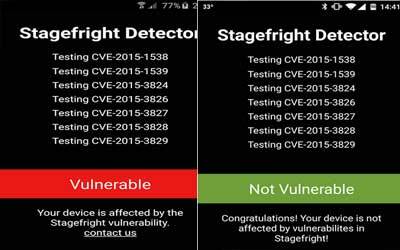 Stagefright Detector 3.0 APK is the latest version which is very popular tool to detect the vulnerabilities. Zimperium Mobile Security recently announced the presence of a new threat for Android users. This threat is called “Stagefright”, and this vulnerability is predicted to threaten about 950 million Android users around the world. The most vulnerable device is smartphone that still use Android-based Jelly Bean or previous generations. Broadly speaking, Zimperium informed that Stagefright attack targets through the process of video, especially on MMS messaging features of the phone. The attack will be sent via message media to attack the system. After attack into the system, attacker would have the ability to operate mobile phone remotely from a distance. All components such as microphone, camera, and other function keys can be controlled. More danger again, messages sent to mobile phone users do not have to wait to be opened in order to be executed. Google has sought to overcome these problems with software patch updates. However, the presentation number of Android-based mobile devices Lollipop is still around 12%. There are many other devices that use the Android version Jelly Bean and below. Fixing hangs on certain devices. Included the latest vulnerability in Stagefright library (CVE-2015-3864). First of all this app is a great tool and I’m loving that you’re keeping it updated. This app is only designed to check if you are vulnerable to it. Unfortunately the only fix is to way for a fix from your carrier.